Pennie Lindeque is a senior scientist at Plymouth Marine Laboratory in the strategic science area Marine Ecology and Biodiversity. 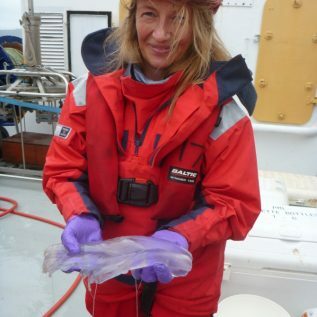 She leads the Research Topic ‘Microplastics and Eukaryote molecular approaches’ and has >20 years of experience in the development, systematics and trophic interactions of eukaryotes, in particular zooplankton. Current focus relevant to the DIAPOD project includes developing molecular techniques for identification of holoplankton and meroplankton, including Next Generation Sequencing and eDNA technologies. Pennie has published 35 peer reviewed papers with > 1775 citations, is an invited chair of the Study Group on Integrated Morphological and Molecular Taxonomy (SGIMT) and currently holds the position of Head of Postgraduate Studies at PML.